When Holi, the festival of colour comes to Obaidullaganj, in Vidisha, Madhya Pradesh, it is time for giant bonfires and chilly evenings of roasting holika (tender green), channa (gram). This activity symbolises the end of winter... And the end of evil. In mythological terms this translates into the death of demon goddess Holika, who burnt to death in a fire much to Prahlad's relief. But bonfires do not start burning in Obaidullaganj and in the surrounding villages of Bhiyanpur, Kari Talai, Jondra and hundreds of others till the first bonfire is lit at the Vaishnodevi temple up on the remote, deserted Bhimbetka hill. On dark nights as soon as the orange flare of light indicating that the sadhus (holy men) and pandits (priests) on the pahad (hill) have lit their fire, is spotted, the soyabean and wheat farmers and their families on the green plateau below, light their piles of wood. Holi hai. 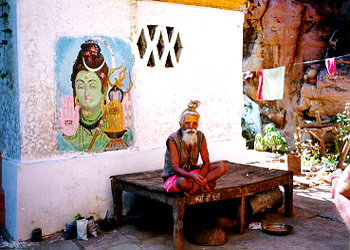 A sadhu – one of five hermit-types that live on this deserted hill – will tell you that the Vaishnodevi temple located in a small cave has been there since the time of the Pandavas. "Socho, das hazar sal pahile. About 10,000 years ago." Bhimbetka is derived from the word Bhim ka bethika… the place where Bhim sat and meditated. The tiny temple is extraordinarily quaint. 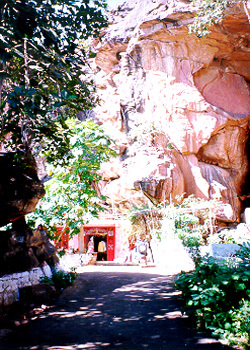 The sadhus live in different little caves attached to the main cave where the colourful murti (idol) is located. Several cows grazing on the hillside provide the sadhus with milk and dahi.. 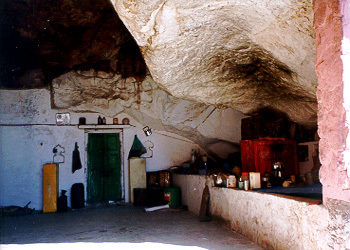 Huge beehives -- two or three feet across -- hang from the roofs of the cave. 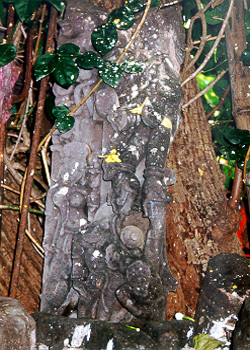 Nearby are some ancient pieces of sculpture rescued from a nearby site that the sadhus have added to their collection of murtis and has been suitably garlanded and tikka-fied. A samadhi (tomb) of a revered sadhu baba occupies a special place close by. It must be an idyllic existence. Every Ram Navami this remote hillside is the location of a robust mela or fair. "How many people come. Five hundred to one thousand?" The sadhu looks aghast. "Does a fair happen with just 500 people??? Ten thousand people come here. Hundreds of stalls come selling toys, food and knick knacks." 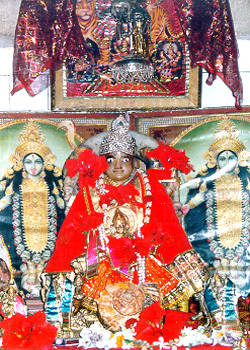 But Bhimbetka's fame does not come from this temple dedicated to Parvati. It comes from the 500 or so caves located nearby. These large, almost cosy caves wreathed in foliage, are home to hundreds of plates of prehistoric art on its walls and ceilings -- some as old as 10,000 years. In fact it is evident from these cave paintings that these spacious stone shelters have been home to man from the early Stone Age right through to the end of the Stone Age; from 10,000 to 2,000 years ago. Thus Bhimbetka has a special significance in India, and also apparently Southeast Asia, as the oldest collection of pre-historic art. Discovered accidentally by archaeologist V S Wankaner in 1958, Bhimbetka has been the site of immensely interesting excavations. 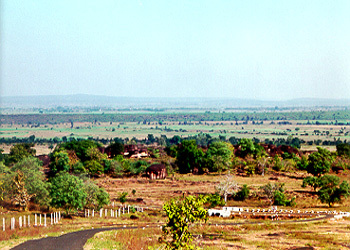 Tools, like axes, knives, cleavers, scrapers, and home utensils, like grinders, and embellished bone objects were discovered at this spot at 20.50 N and 77.37 E, just 45 km from Bhopal. Much of these tools have been crafted out of chalcedony and chert and the kitchen utensils from stone. And Bhimbetka has fortunately not been discovered (accidentally or by design) by tourists, though MP Tourism has given the location some prominence. The beautiful hillside dotted with its strange stone structures and unusual topography is virtually untouched. Remote. Population free. Guide Krishna -- a farmer from Obaidullaganj who pedals every day for half an hour to his guide duties at Bhimbetka -- declares that a seven-foot skeleton was taken out of one cave and is now housed in the Indian Museum, Calcutta.